You know what would be a fun family activity for October? A Halloween family movie night! 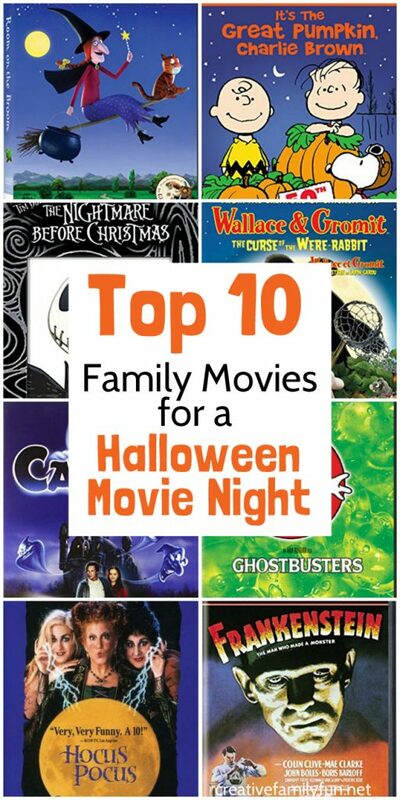 Here are some fun family Halloween movies to choose from. Some of these are traditional Halloween choices and others are just a little bit of spooky fun. But, all would be perfect for a Halloween family movie night. 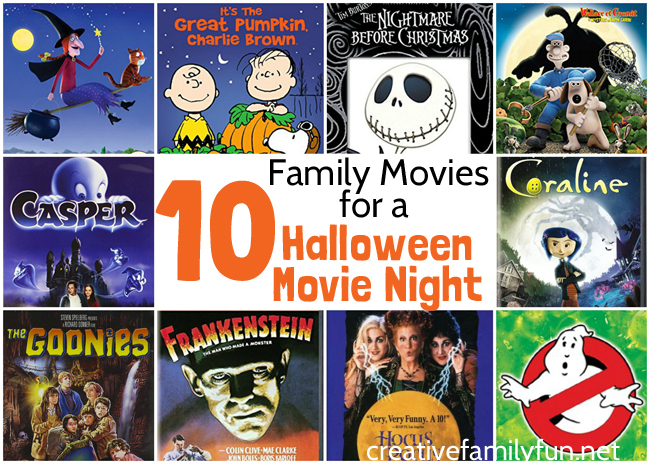 And, once Halloween is over, check out the rest of our recommended family friendly movies here. To help you choose a movie, I’m including the age ratings I found on Common Sense Media, which is a great place to check for information about any movie (or book) you want to share with your kids. These choices are perfect for your toddlers and preschoolers, but are enjoyable for all ages. It’s the Great Pumpkin Charlie Brown (Unrated): This movie fills me with nostalgia because it was my favorite Halloween movie when I was a kid. Now, my kids love to watch it every year. This is another gentle choice that it not at all scary. Recommended for ages 4 and up. 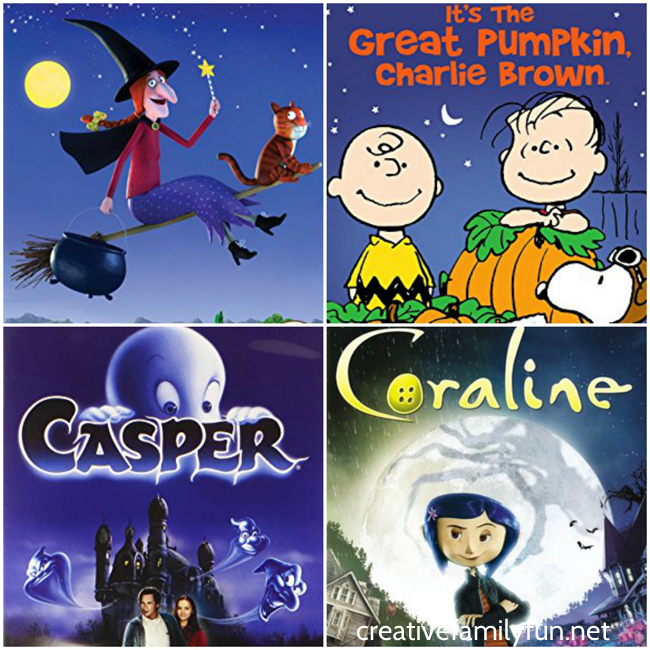 These family Halloween movies are perfect for elementary aged kids and be can enjoyed by everyone. The Nightmare Before Christmas (rated PG): This quirky Tim Burton classic is both fun for Halloween and Christmas, although I’ve always thought it more suited for Halloween. Clocking in at just 76 minutes, it’s a good shorter choice for family movie night. Recommended for ages 7 and up. Wallace & Gromit: The Curse of the Were-Rabbit (rated G): If you’ve never watched a Wallace & Gromit show, you’re definitely missing out. They’re so funny and this Halloween choice will definitely get the family laughing. Suitable for ages 7 and up. Casper (rated PG): Based on the classic cartoon, this choice has ghosts, a haunted house, and is kid-friendly – definitely a fun choice for a Halloween family movie night. Suitable for ages 8 and up. Coraline (rated PG): This movie, based off of the book by Neil Gaiman, is not necessarily a Halloween movie, but it’s spookiness makes it perfect for Halloween time. (And if you haven’t already, you should read the book first!) This one could be a little scary for younger kids. Suitable for ages 9 and up. 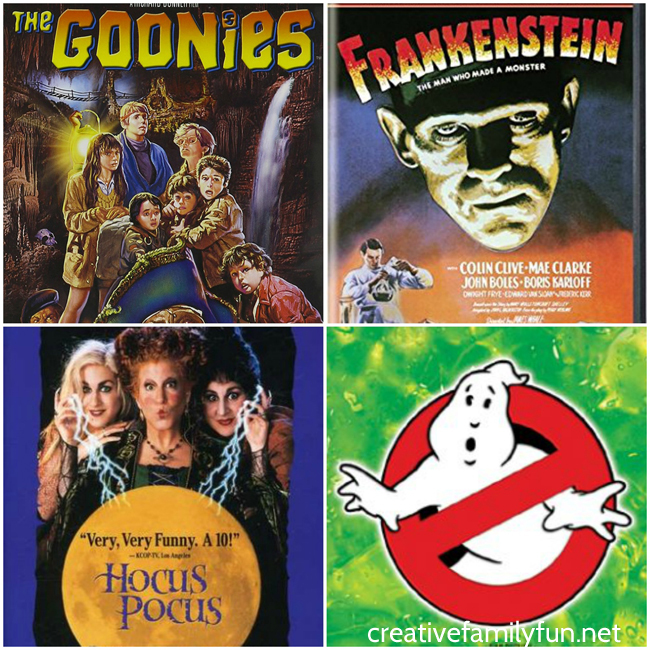 These family Halloween movies for tweens aren’t necessarily Halloween-specific, but they’re full of ghosts, monsters, and lots of spooky fun. Plus, they’re heavy on nostalgia that the adults will love! Frankenstein, 1931 version (Nonrated) There’s no better time than Halloween to grab a classic horror flick. Frankenstein is spooky but tame in the way that all the classic horror films are tame. It’s a lot of fun to watch. That being said, make sure you grab the 1931 version starring Boris Karloff and not one of the more recent versions! Suitable for ages 10 and up. Hocus Pocus (rated PG): When I first started thinking about family Halloween movies, this was the first one that came to mind (even before Charlie Brown). This comedy about three witches will get the whole family laughing. Suitable for ages 11 and up. Ghostbusters (rated PG): I have not seen the most recent version of this movie, so my recommendation is for the 1984 classic. It’s a fun option that both kids and parents will enjoy. And, if you don’t get to it for Halloween, it’s a fun movie choice to watch with your tweens anytime of the year. Suitable for ages 11 and up. Did I miss any of your favorites? What is your favorite Halloween movie?